Other developments: for all the years I’ve been making pie crusts, I’ve always preferred butter. This summer, I decided to try substituting about a quarter of the butter with vegetable shortening. I’m now a convert. Butter makes for the best flavor, but adding some shortening makes the crust more tender and flaky (without any film), and any decorative features I add hold their shape better due to the shortening. (This is important to me because this year I’ve started to work on the aesthetics of pies much more than I have in the past). And to boot, I’ve also started routinely adding a tablespoonful of vinegar along with the ice water. 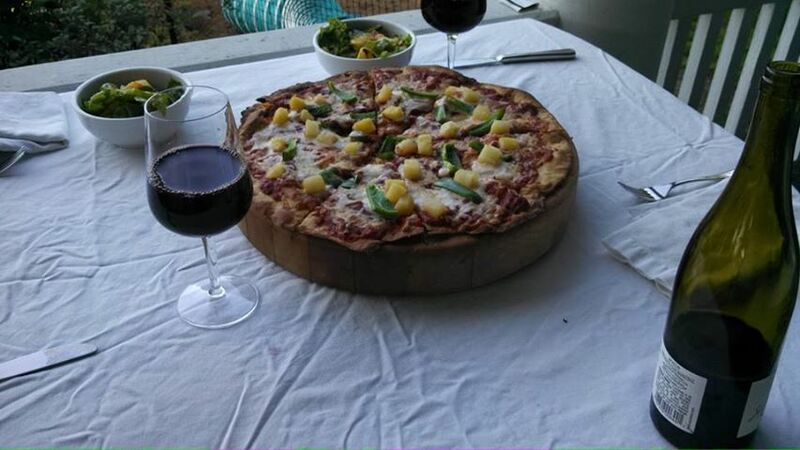 It wasn’t just the pie–oh no, Edward and I went a little further this summer, and we decided to make our own pizza at home. Through trial and error, and the acquisition of a few critical tools, we’ve achieved a pretty impressive pizza. The basics? Roll out the dough, prick with a fork, slide onto a pizza peel covered with corn meal, slide onto a pizza stone (also covered with corn meal) in a 475 degree oven for a 7 minute pre-bake. Remove, brush the dough with olive oil, decorate the pizza with our preferred topping, and then slide back into the oven for another 7 minutes. The pizza peel helped a lot, as did the corn meal and a special pizza rolling cutter. I had a recipe which informed me that one can use the “no-rise” method, meaning just whip up the dough with no rising, therefore not so time-consuming. For most of this summer, that’s how we did it, but this past weekend, I decided to see if the “long rise” method would yield any better results. On Saturday, I mixed the dough at 10am and let it rise until 5:30pm. Then we followed the same process. I had high hopes, but–sitting over dinner, we decided neither the taste or consistency of the dough was that much better with the long rise. In a way, this was really good news–no need to plan ahead! 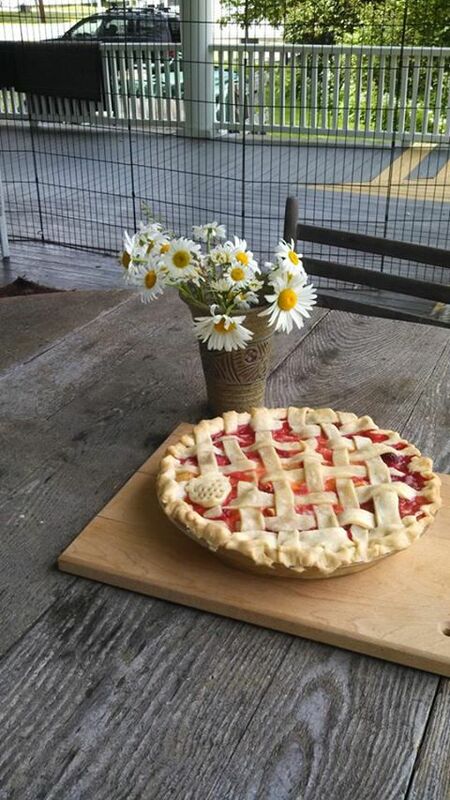 Here’s a slide show, with captions, of the pies I made this summer. There were a couple–namely this weekend’s Honey Acorn Squash Pie and a plain old Blackberry Pie back in July sometime, of which I took no photos. But here are the remainder, in all their glory. Been Too Long at the Fair. (Bonnie Raitt) Lancaster, NH, 2013. The Lancaster Fair. It’s an event of enormous cultural significance in this part of the world. 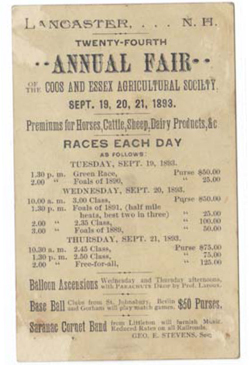 The fair started in 1870, and was known as the Coos and Essex Co Agricultural Fair. Initially, its main focus appears to have been horse racing and baseball, with selling of agricultural products and livestock. 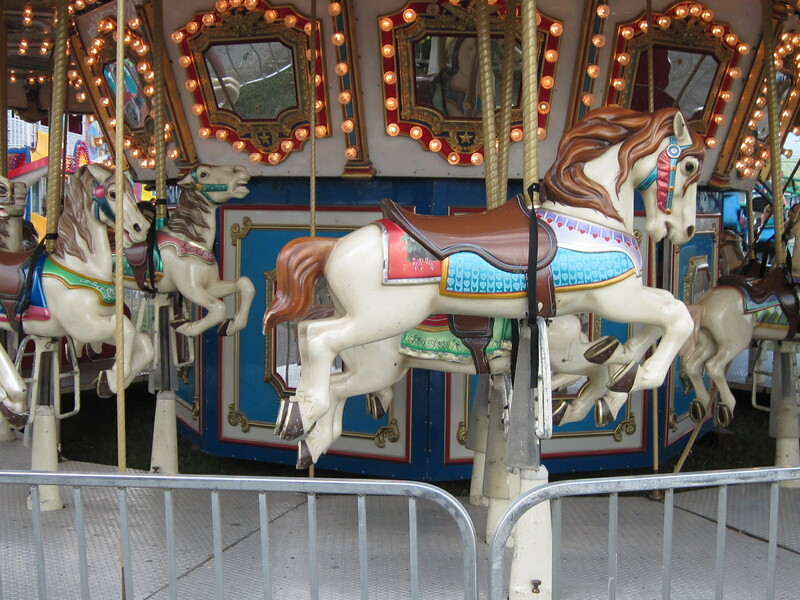 New England is dotted with similar fairs, large and small. This one is pretty big as fairs go, lasting for six days. There’s a certain inevitable energy and excitement to the fair. But in the end, reflecting on my time there, I couldn’t help but think of an old song covered famously by Bonnie Raitt (but originally written by Joel Zoss).